The National Livestock Identification System (NLIS) was introduced as a mandatory system in 2005. Its primary role is to provide a traceability system for individual animals and their movements for the purpose of: Biosecurity, food safety, product integrity and market access. For producers there is an opportunity to adopt the NLIS system beyond its mandatory requirements and use it in their everyday business management. By using the NLIS tag and linking it to animal performance measures producers can build a history of individual animal performance to support their business decisions. The information that you need to record will depend on your enterprise type and business goals. How this information needs to be collected and how often will determine the equipment you will need. The possibilities are endless with electronic recording, especially with specialised software programs, however, the information that you get out is only as good as the information you put in. So, give some thought to the key performance indicators for your business and what information will be useful. Production – Recording individual animal performance, for example daily weight gain and temperament, identifies animals that increase productivity and profitability. Reproductive performance – Recording individual animal reproductive performance (pregnancy and lactation status) identifies superior animals and provides links between desired traits and future offspring. Feedback carcase data – Recording and linking paddock performance and management data to carcase data to assess whole of life performance. Animal activities – Recording individual animal history (e.g. vaccinations, hormonal growth promotants, sickness, vetarinary or chemical treatment) provides essential, documented information for Livestock Production Assurance. Whether you are starting from scratch, already use a paper-based recording system or have gone electronic following the steps below can help make the most of your NLIS investment and time. Identify your business/enterprise goals and select key performance indicators that will affect your bottom line i.e. gain kg/day, pregnancy and weaning rates. Work out what information or data you need to help you make decisions regarding these areas, including the amount of data, how often and with what. Investigate equipment options to achieve this. For example, the bare minimum to collect meaningful weight gain data may be a vet crush, scales and NLIS reader. Analyse the information and make adjustments to your management and/or your information collection system. Check how successful any changes you made were and start again. As with any new purchase it is important to know what your requirements are before you go shopping. 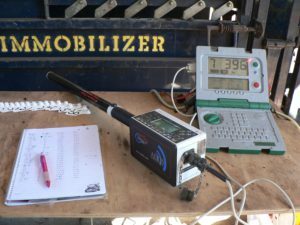 For a basic herd recording system most producers require a weighing system made up of load bars, platform and scale indicator and a tag reader such as a panel reader or wand. Some scale indicators have the capacity to collect extra information via a data entry panel but others are very basic and another piece of equipment such as a laptop may be needed to collect extra data. Terms such as ‘dumb’ and ‘smart’ indicate the differing capacity to collect and store information. One may find that a smart indicator has the capability to store and sort the information they need thus saving money on herd software programs. The options for NLIS readers are either stick/wand or panel. The stick or wand readers are more mobile but need to be manually operated while race readers are fixed and less mobile but free up an operator. A dumb reader will simply record the NLIS tag number and send it elsewhere, such as to a scale indicator. A smart reader has a memory and can retain multiple records and offer more functions. Consider Bluetooth communication technology as it will eliminate need for cables in yards. As an on property recording system intensifies there is a corresponding increase in the reliance on technology which at times can fail. When this occurs the outcome can range from slight inconvenience to loss of collected data or the inability to collect further data at that time. Some planning and thought is therefore warranted when commencing monitoring using electronic devices. One alternative is to have back-up options of critical pieces of hardware, namely NLIS tag readers and scale leads and load bars. There are costs associated with this option but it does give one the ability to continue to collect data if critical hardware fails. Preparedness for breakages and equipment failure is essential. The capabilities of different software packages vary but they usually include a combination of integrated paddock recording and farm mapping, whole of life performance recording, general herd management, and pedigree recording. Expect to pay from $500 to over $3,000 depending on components and back up support. Providers of NLIS hardware also supply programs with their product which may be suitable depending on individual needs. Operational training for the packages is offered at the point of installation. The majority of companies offer further over-the-phone help desk service for clients experiencing difficulties. Some packages offer a huge range of supplementary components that may not be used initially. As you become more confident in a program you may find additional uses for the information and expand the use of the package and any extra components. This may also branch out in other facets of your business, keep your options open. It is important to be aware of updates that the company may release as the package is improved and verify if these updates are included in the original price or have to be purchased each time an update is available. Improvements can occur regularly with hidden costs which can become expensive if not included at the point of purchase. Speak to someone who is already using a software package and learn from their mistakes. Purchase a product that is going to work for your situation, be careful not to become overwhelmed with the prospect of a packages capability. Finally do your own research and ask heaps of questions. More detailed information can be obtained by contacting the software companies direct or searching the internet for farm management software. Karl McKellar, Department of Agriculture and Fisheries. See how Australia’s National Livestock Identification System (NLIS) can be used as a management tool to improve Australian livestock enterprises. Read more about the National Livestock Identification System. 6:33 minutes published 13 January 2012 by MLAfeedbackTV. In this video Alan Laing, formerly Queensland Government, outlines the advantages of using NLIS together with herd recording software to record pedigrees and lifetime performance of cattle. 4:50 minutes published 3 May 2012 by FutureBeefAu.